If Dmitry Tursunov wasn't playing the match of his life, it was close. The Russian veteran, based in the Sacramento suburb of Granite Bay, was tied at one set apiece with 17-time Grand Slam singles champion Roger Federer on Court Philippe Chatrier in the third round of the French Open. Then, right on cue, the 31st-seeded Tursunov felt a twinge in his left hip. Federer, the fourth seed and 2009 champion, coasted from there in a 7-5, 6-7 (7), 6-2, 6-4 victory on Friday in Paris. "Overall, the first two sets ... I felt that it was a fairly even battle out there," Tursunov, who has battled injuries throughout his career, told reporters. "It's hard for me to predict, but definitely playing on one leg is not going to make things easier. Tough luck for me, but hopefully I'll get him somewhere else." Tursunov, 31, fell to 0-5 against Federer, 32, after their first meeting in a Grand Slam tournament and first on clay. At least Tursunov won a set against the Swiss star for the second time. In the second round of men's doubles, former Stanford All-American Scott Lipsky of Irvine and Santiago Gonzalez of Mexico lost to No. 5 seeds and 2013 runners-up Michael Llodra and Nicolas Mahut of France 7-6 (2), 6-4. No. 1 seeds and defending champions Bob and Mike Bryan cruised past Jonathan Eysseric and Marc Giquel of France 6-3, 6-3 on Thursday in the second round of men's doubles in the French Open in Paris. The 36-year-old Bryan twins, former Stanford stars who grew up in Camarillo in the Los Angeles area, seek their third French Open title, 16th Grand Slam men's doubles crown and 99th overall championship. In the first round of women's doubles, sixth-seeded Raquel Kops-Jones of Fresno and Abigail Spears of San Diego outclassed Sandra Klemenschits and Yvonne Meusberger of Austria 6-3, 6-3. Kops-Jones, a former Cal standout, also won in the opening round of mixed doubles with Raven Klaasen of South Africa. They edged Anastasia Rodionova, tennis' A-Rod, of Australia and Colin Fleming of Great Britain 3-6, 6-3 [10-8]. Ex-Stanford star Scott Lipsky and Jie Zheng of China lost in the first round of mixed doubles to Anna-Lena Groenefeld of Germany and Jean-Julien Rojer of the Netherlands 7-5, 6-3. Groenefeld won the 2009 Wimbledon mixed doubles title with Mark Knowles, a longtime former Sacramento Capital in World TeamTennis. Dmitry Tursunov will break new ground in his series against Roger Federer on Friday. The 31st-seeded Tursunov, a Russian based in the Sacramento suburb of Granite Bay, will meet the Swiss star in a Grand Slam tournament and on clay anywhere for the first time. The question is whether Tursunov can pick up his first victory over Federer. Tursunov advanced to the third round of the French Open for the first time since 2008, equaling his best result there, with an impressive 6-4, 7-5, 6-1 victory today over Sam Querrey, a San Francisco native and former Sacramento Capital in World TeamTennis. Querrey, 6-foot-6 (1.98 meters), advanced to the third round of the French Open last year for his best result at Roland Garros. Federer, the No. 4 seed and 2009 champion, topped qualifier Diego Sebastian Schwartzman of Argentina 6-3, 6-4, 6-4 to become the first man to record at least 60 singles match wins at all four Grand Slam tournaments. Schwartzman, 21, was playing in the main draw of a Slam for the first time. Federer is 4-0 against Tursunov, all on hardcourts, including a 6-4, 6-2 victory in the first round of the 2008 Olympics in Beijing. Tursunov has won one set in the series, in the third round at Toronto in 2006. --Tursunov is playing well. He beat clay-court specialist Potito Starace of Italy for the first time in four career matches in the first round and has not lost a set in the tournament. --Tursunov has nothing to lose against the 17-time Grand Slam singles champion. --Tursunov extended Federer to 7-6 (7), 7-6 (2) in the third round at Indian Wells in March in their last meeting. If Tursunov had pulled out the first set, the match could have gone his way. --Federer could lack focus -- not to mention sleep -- after the recent birth of his twin sons. On the other hand, the three-out-of-five-set format in the French Open reduces the chances of an upset. In the first round of doubles, Tursunov and Matthew Ebden of Australia lost to No. 3 seeds and 2010 champions Daniel Nestor of Canada and Nenad Zimonjic of Serbia 6-2, 3-6, 6-3 in the first round. Ebden reached the singles finals at the Napa and Tiburon Challengers last fall. Top seeds and defending champions Bob and Mike Bryan dismissed Martin Emmrich and Christopher Kas of Germany 6-2, 6-1. The 36-year-old Bryan twins, former NCAA doubles champions from Stanford, are seeking their third French Open title, 16th Grand Slam men's doubles crown and 99th overall championship. first round of the French Open. For a clay-court novice, Bradley Klahn put up a good fight today. In a battle of 23-year-old left-handers, the 2010 NCAA singles champion from Stanford lost to wild card Axel Michon of France 6-1, 6-7 (4), 5-7, 6-1, 6-4 in the first round of the French Open in Paris. Klahn, from Poway in the San Diego area, is ranked No. 71 in the world and Michon No. 206. But Michon grew up on clay. For Klahn, clay is something you played with as a kid. Klahn played in his first main-draw match at Roland Garros and second overall. He lost to Augustin Velotti of Argentina in the first round of qualifying last year. Furthermore, Klahn played for the first time since losing to Spain's Guillermo Garcia-Lopez in the opening round at Miami on a hardcourt in March. Garcia-Lopez upset third seed and reigning Australian Open champion Stan Wawrinka in the first round of the French Open on Monday. Klahn has lost his last four singles matches, all at the Grand Slam or ATP World Tour level. He hasn't won since taking the Adelaide title in February for his second straight Challenger crown. Klahn also lost in the first round of doubles in Paris, falling with Neal Skupski of Great Britain to Teymuraz Gabashvili of Russia and Michail Kukushkin of Kazakhstan 7-6 (5), 6-4. Another former Stanford star, 32-year-old doubles specialist Scott Lipsky of Irvine, advanced with Santiago Gonzalez of Mexico. They topped Colin Fleming and Ross Hutchins of Great Britain 7-6 (5), 6-4. Hutchins, a 29-year-old doubles specialist, missed last year with Hodgkin's lymphoma. Lipsky won the 2011 French Open mixed doubles title with Casey Dellacqua of Australia. Gonzalez and Lipsky could face fifth seeds and 2013 runners-up Michael Llodra and Nicolas Mahut of France in the second round. Lynn Chi ran out of magic. The Cal standout lost to Virginia's Danielle Collins 6-2, 7-5 today in a matchup of unseeded sophomores in the NCAA women's singles final in Athens, Ga.
Chi, from Weston, Fla., broke for 5-3 in the second set against her former junior rival but dropped the last four games. “(Collins) played really well at the end," the 24th-ranked Chi (38-11) said on georgiadogs.com. "She hit some really nice shots. I made a few errors. I had that one game, I think, where I hit four balls in the tape or around the tape area. Chi saved a match point in her first-round victory over No. 9-16 seed Emina Bektas of Michigan and knocked off top-seeded and top-ranked Jamie Loeb of North Carolina in the quarterfinals after losing the first set. Chi then outlasted Abigail Tere-Apisah of Georgia State in the semifinals after Tere-Apisah served for the match at 5-4 and 6-5 in the third set. Second-seeded Marcos Giron of UCLA beat unseeded Alex Sarkissian of Pepperdine 6-4, 6-1 in an all-Los Angeles area men's final. On Tuesday, the region swept the team titles for the first time as the UCLA women won their second crown and the USC men took their fifth in six years and ninth overall. Chi was trying to become the fourth straight player from Cal or Stanford to win the women's title and the third overall from her school. The Bears' Suzi Babos and Jana Juricova triumped in 2006 and 2011, respectively, and Stanford's Nicole Gibbs prevailed the following two years. Collins, a St. Petersburg, Fla., resident who transferred from Florida, gave Virginia its first NCAA women's tennis title of any kind (singles, doubles or team). “It’s incredible," said the 32nd-ranked Collins (36-10), who upset No. 9-16 seed Anett Schutting of Cal in the second round, No. 2 Robin Anderson of UCLA in the third round and No. 7 Hayley Carter of North Carolina in the quarterfinals. "I still can’t believe it. It’s all really shocking to me, and I’m still really caught off guard right now, to be honest. "I’m just really excited to be able to do it for myself and also our program. I know it’s the first time the women’s side has had this much success. It’s been a pretty historic career for us, and I’m really excited to do it for my school and for my coaches. I know how much it means for them, too. They’ve helped me so much this year, and I think it’s been night and day since I came to Virginia." The Cavaliers men have had considerable success in the NCAA Championships. They won the team title last year, Somdev Devvarman captured the 2007 and 2008 singles crowns, Dominic Inglot and Michael Shabaz earned the 2009 doubles title, and Drew Courtney and Shabaz took the 2010 doubles trophy. Giron became the fourth man from a California school in the Pacific-12 Conference in five years to win the NCAA singles title. Stanford's Bradley Klahn triumphed in 2010 (in Athens), USC's Steve Johnson in 2011 and 2012, and Ohio State's Blaz Rola last year. The doubles finals hardly could have contrasted more. Second-seeded Mikelis Libietis and Hunter Reese of Tennessee edged fourth-seeded Peter Kobelt and Kevin Metka of Ohio State 7-6 (4), 6-7 (3), 7-6 (6). Earlier, fourth-seeded Maya Jansen and Erin Routliffe of Alabama crushed second-seeded Lauren Herring and Maho Kowase of host Georgia 6-1, 6-0. Barring a colossal upset, either Dmitry Tursunov or Sam Querrey will face Roger Federer in the third round of the French Open. The 31st-seeded Tursunov, a Russian based in the Sacramento suburb of Granite Bay, and Querrey, a San Francisco native living in Las Vegas, beat 32-year-old Italians in straight sets today to set up a second-round meeting and their first on clay. Tursunov dispatched qualifier Potito Starace 6-1, 7-5, 6-2, and Querrey handled Filippo Volandri 7-6 (3), 6-4, 6-3. Federer, the 2009 champion seeded fourth, dismissed Lukas Lacko of Slovakia 6-2, 6-4, 6-2 and will face qualifier Diego Sebastian Schwartzman of Argentina in the second round. Tursunov, 31, had never won a set in three career matches, two on clay, against Starace. They also met 10 years ago in the first round of the French Open, with Starace cruising 6-2, 6-3, 6-4. Volandri fell to 1-14 this year in Grand Slam or ATP World Tour tournaments. The 32nd-ranked Tursunov and No. 64 Querrey have split four career meetings, all on hardcourts. Querrey won the last meeting 7-5, 6-4 in the first round at Brisbane in January. Tursunov is 0-4 and Querrey 0-2 lifetime against Federer. Tursunov has won one set against the 32-year-old Swiss star and Querrey none. Five of the six matches have come on hardcourts. Federer beat Querrey 6-4, 6-4, 6-3 in the first round of the French Open six years ago in their last meeting. Tursunov and Federer met for the first time in six years in March at Indian Wells, with the Federer prevailing 7-6 (7), 7-6 (2) in the third round. The best results of Tursunov and the 26-year-old Querrey, both hard hitters, at the French Open are third-round appearances in 2006 and 2008 (Tursunov) and last year (Querrey). Cal's Lynn Chi either is destined to win the NCAA women's singles title or is living on borrowed time. The unseeded Chi, ranked 24th in the nation, rallied for the third time in the tournament today to reach Monday's final against unseeded Danielle Collins of Virginia in Athens, Ga.
Chi, a sophomore from Weston, Fla., edged unseeded Abigail Tere-Apisah, ranked 22nd, of Georgia State 6-4, 3-6, 7-6 (2). Tere-Apisah -- a senior from Papua New Guinea, off the northern coast of Australia -- served for the match at 5-4 and 6-5 in the third set. "(Tere-Apisah) was hitting some really nice shots, and I was just trying to stay in the match," Chi, a sophomore from Weston, Fla., said on georgiadogs.com. "I was just trying to calm myself down. A few points in the 5-6 game went my way, and in the tiebreak I just went for it. And then I broke, and most of the balls went my way, so I'm glad about that." Second-seeded Marcos Giron of UCLA and unseeded Alex Sarkissian of Pepperdine will meet in an all-Los Angeles area men's final. USC and cross-town rival UCLA swept the men's and women's team titles, respectively, for the first time on Tuesday. Chi saved a match point in her first-round victory over No. 9-16 seed Emina Bektas of Michigan and knocked off top-seeded and top-ranked Jamie Loeb of North Carolina in the quarterfinals after losing the first set. "I was glad to just get into the tournament," Chi confessed. "I did not even imagine me being in the finals. I just figured there are so many great players in the tournament. It really is about just a few points. Look at my first-round match. 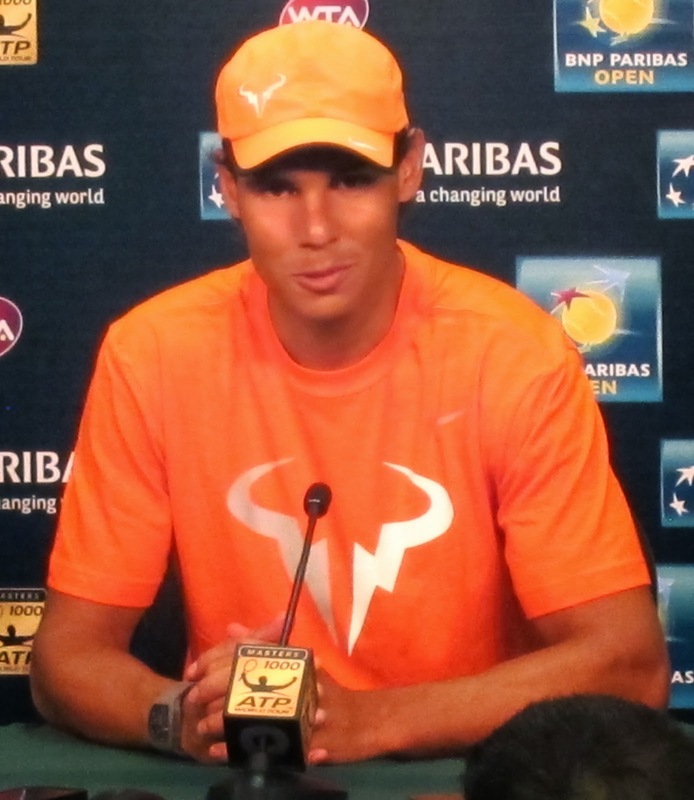 I had to save match point, so if that one didn't go my way, then it could be a different story." Chi became the first Bear to reach the singles final since 2011, when Jana Juricova became Cal’s second NCAA singles champion. Suzi Babos won the title in 2006. Chi and Collins, a sophomore transfer from Florida and resident of St. Petersburg, Fla., will meet on Monday at 9 a.m. PDT (live streaming and scoring at www.georgiadogs.com). Collins topped unseeded Ester Goldfeld of Duke 6-3, 7-6 (3). Collins defeated No. 9-16 seed Anett Schutting of Cal 6-3, 6-3 in the second round, No. 2 seed Robin Anderson of UCLA 6-1, 6-4 in the third round and No. 7 seed Hayley Carter of North Carolina 6-3, 3-6, 7-5 in the quarterfinals. Giron beat No. 9-16 seed Soren Hess-Olesen of Texas 7-5, 6-3, and Sarkissian downed unseeded Denis Nguyen of Harvard 4-6, 7-5, 6-2. Why he'll win -- Nadal has won the last four French Open titles and eight overall in nine years. Why he won't -- He has suffered three losses on clay in 2014, the most he has had in a season in 10 years. In a recent interview with Time magazine, he said the left knee injury that caused him to miss seven months in 2012-13 is still bothering him. Northern California connection -- None. Why he'll win -- Djokovic is ultra-talented and ultra-motivated. The Serb can complete a career Grand Slam, and he's playing for his flood-ravaged country. Djokovic has beaten Nadal four straight times, including last week to win the Italian Open on clay. Why he won't -- He's 0-5 against Nadal in the French Open, including losses in the 2013 semifinals and 2012 final. The right-hander missed part of the clay-court season with a right wrist injury. Why he'll win -- Wawrinka won the Australian Open in January for his first Grand Slam title and captured Monte Carlo on clay last month for his first Masters 1000 title. Why he won't -- He has never been past the quarterfinals in nine appearances at Roland Garros. Why he'll win -- One of Federer's record 17 Grand Slam singles titles came in the 2009 French Open. Why he won't -- He'll be 33 in August, and he lost in the first round of the Italian Open days after his wife delivered twin boys. Why she'll win -- The two-time and defending champion needs one more Grand Slam singles title to tie Martina Navratilova and Chris Evert for fourth all-time behind Margaret Court (24), Steffi Graf (22) and Helen Wills Moody (19). Since the start of the 2012 clay-court season, Williams is 53-2 on clay. Why she won't -- She'll be 33 in September, and she lost to Ana Ivanovic in the fourth round of the Australian Open in January. NorCal connection -- Williams won the Bank of the West Classic at Stanford in 2011 and 2012, and she was a semifinalist there in 2008 and quarterfinalist in 2009. She's entered in this year's tournament, July 28-Aug. 3. Why she'll win -- Li won the 2011 French Open and this year's Australian Open for her second Grand Clam crown. Why she won't -- She turned 32 in February and lost in the quarterfinals of clay-court tuneup tournaments in Madrid and Rome. NorCal connection -- In Li's only appearance in the Bank of the West Classic, she lost in the first round in 2009 to the top-seeded Williams. Why she'll win -- Sharapova won the 2012 French Open and clay-court tournaments in Madrid and Stuttgart this season. Why she won't -- She lost in the third round of the Italian Open last week to Ivanovic. Sharapova could face Dominika Cibulkova in the fourth round at Roland Garros and Williams in the quarterfinals. Sharapova is 0-15 against Williams since 2004 and 2-16 overall. NorCal connection -- Sharapova was the runner-up to Victoria Azarenka in the 2010 Bank of the West Classic, and she's a two-time quarterfinalist there. Why she'll win -- The former world No. 1 won the 2008 French Open, and she has the wins over Williams and Sharapova this year. Why she won't -- Ivanovic hasn't advanced past the fourth round at Roland Garros since her title there. NorCal connection -- She lost to fourth-seeded Marion Bartoli in the second round of the Bank of the West Classic in 2010 and to Ayumi Morita in the first round at Stanford the following year. Ivanovic plans to return this year. Unseeded Lynn Chi of Cal ousted top-seeded and top-ranked Jamie Loeb of North Carolina 4-6, 6-4, 6-2 today to reach the women's semifinals at the NCAA Championships in Athens, Ga.
Chi, a freshman from Weston, Fla., ranked 24th, improved to 37-10. Loeb, a freshman from Ossining, N.Y., fell to 53-4. "Lynn came out a little bit nervous today, but with her progression and maturity, she was able to shake it off and execute the game plan,” Cal coach Amanda Augustus said on calbears.com. “She kept going for shorter balls, was willing to come in and was doing all the things she had been practicing. But now she’s gaining in confidence and starting to see all the options she has on the court. Meanwhile, all of the remaining men with Northern California ties lost in the singles or doubles quarterfinals. Chi's victory marked the second time in the tournament that she beat a seed after losing the first set. She saved a match point in her 2-6, 7-6 (6), 6-1 victory over No. 9-16 seed Emina Bektas of Michigan in the first round. After that match, Augustus said Chi's "fitness was a major weapon in the third set in comparison to her opponent." In addition, Chi dismissed No. 8 seed Jennifer Brady of national champion UCLA 6-3, 6-2 in the third round. Chi's opponent, Abigail Tere-Apisah of Georgia State, today at 9 a.m. PDT (live streaming and scoring at www.georgiadogs.com) also beat a seed today after dropping the first set. She outlasted No. 5 Beatrice Capra of Duke 4-6, 6-3, 6-1. Chi and Tere-Apisah, who beat 2012 semifinalist Zsofi Susanyi of Cal in the second round, have never met. "Being in the semifinals is something to definitely look forward to," Chi said before the match between Tere-Apisah and Capra. "It is a bit of a surprise for me. I'm not used to having these kind of results. I know they are both really good players, so I'm just going to watch a little bit and go out there and try my best tomorrow." In the other semifinal, Danielle Collins of Virginia will meet Ester Goldfeld of Duke. Collins outlasted No. 7 Hayley Carter of North Carolina 6-3, 3-6, 7-5, and Goldfeld topped No. 9-16 Chanelle Van Nguyen of UCLA 3-6, 6-3, 6-4. Collins has defeated three seeds (No. 9-16 seed Anett Schutting of Cal in the second round, No. 2 Robin Anderson of UCLA in the third round and Carter), and Goldfeld has beaten three Pacific-12 Conference players (unseeded Denise Starr of Cal in the first round, unseeded Krista Hardebeck of Stanford in the second round and Van Nguyen). On the men's side, second-seeded Marcos Giron of UCLA dispatched unseeded Ben McLachlan of Cal 6-1, 6-3. Earlier, No. 9-16 seed Soren Hess-Olesen of Texas subdued unseeded Mackenzie McDonald, a UCLA freshman from Piedmont in the San Francisco Bay Area, 6-3, 0-6, 6-2. Giron will play Hess-Olesen, and Alex Sarkissian of Pepperdine will take on Denis Nguyen of Harvard in a matchup of unseeded players. In doubles, second-seeded Mikelis Libietis and Hunter Reese of Tennessee defeated unseeded Gregory Bayane and Chase Melton of Cal 7-5, 6-3. Roger Federer seeks his second French Open title. No. 31 seed Dmitry Tursunov, a Russian veteran based in the Sacramento suburb of Granite Bay, could meet fourth seed and 2009 champion Roger Federer in the third round of the French Open. But it won't be easy for Tursunov to get that far. The draw for the year's second Grand Slam tournament, scheduled for Sunday through June 8 in Paris, was held Friday. Tursunov has a deceptively tough first-round match against qualifier Potito Starace, a 32-year-old Italian ranked No. 178, on Sunday. Tursunov, 31, has never won a set in three career matches, including two on clay, against Starace. They met 10 years ago in the first round of the French Open, with Starace cruising 6-2, 6-3, 6-4. Clay is Starace's best surface and the hard-hitting Tursunov's worst. The Tursunov-Starace survivor could face Sam Querrey, a San Francisco native and former Sacramento Capital in World TeamTennis, in the second round. The 6-foot-6 (1.98-meter) Querrey, ranked 64th, will play another 32-year-old Italian, No. 97 Filippo Volandri, for the first time on Sunday. Stanford graduate Bradley Klahn will play wild card Axel Michon of France in a first-round clash of 23-year-olds. Klahn is ranked No. 73 and Michon No. 206. The winner will meet either 19th-seeded Kevin Anderson, a 6-foot-8 (2.03-meter) ex-Capital from South Africa, or Stephane Robert of France. Tursunov has won only one set in four career matches, all on hardcourts, against Federer. They met for the first time in six years in March at Indian Wells, with the 32-year-old Swiss star prevailing 7-6 (7), 7-6 (2) in the third round. Querrey is 2-2 lifetime, also all on hardcourts, against Tursunov. Querrey won the last meeting 7-5, 6-4 in the first round at Brisbane in January. The best results of Tursunov and the 26-year-old Querrey, also a hard hitter, at the French Open are third-round appearances in 2006 and 2008 (Tursunov) and last year (Querrey). USTA National Hardcourts -- The deadline to enter the United States Tennis Association National Open Hard Court Championships in San Diego is Tuesday at 11:59 p.m. (PDT). The national tournament, which will feature some of the top Open division players in the country, is scheduled for June 2-8 at the Balboa Tennis Club. The tournament offers men’s singles and doubles, women’s singles and doubles, and mixed doubles. The entry fee is $65 for singles and $43 per player for doubles. It's starting to come together for Lynn Chi. The unseeded Chi, a Cal sophomore, upset eighth-seeded Jennifer Brady of UCLA 6-3, 6-2 in 90-degree (32.2 Celsius) heat today to reach the quarterfinals of the NCAA Championships in Athens, Ga.
“From the first point of the match, (Chi) really decided to play the ball early,” Cal coach Amanda Augustus said on calbears.com. “Her goal was not to give up the baseline, and then Lynn took advantage of all the shorter balls she got and never let Jenny take control of a point. "Lynn’s really been hitting the ball clean all tournament long. It’s just so exciting to see her maturing as a competitor. She’s always had the shots. Now she’s in command and is able to bury those shots when necessary against a particular type of opponent. She made adjustments from the last time when she played Jenny, which was a really close match (Brady won 6-4, 7-5 in the semifinals of the Pacific-12 Conference Championships on April 26 in Ojai en route to the title)." finals of the NCAA Championships in Athens, Ga. Reaching the men's quarterfinals were Cal senior Ben McLachlan and UCLA freshman Mackenzie McDonald of Piedmont in the San Francisco Bay Area. Stanford's Kristie Ahn, seeded third in the women's draw, retired from her third-round match with an undisclosed injury while trailing unseeded Abigail Tere-Apisah of Georgia State 6-3, 1-0. Also eliminated were No. 9-16 seed Jenny Jullien of Saint Mary's and unseeded Carol Zhao of Stanford. Jullien lost to seventh-seeded Hayley Carter of North Carolina 7-5, 6-2, and Zhao, a freshman, fell to No. 9-16 seed Chanelle Van Nguyen of UCLA by the same score. Chi, from Weston, Fla., will face top-seeded Jamie Loeb of North Carolina on Saturday. Loeb, a freshman from Ossining, N.Y., defeated 9-16 seed Breaunna Addison of Texas 7-5, 6-4. McLachlan, from New Zealand, dismissed Ryan Lipman of Vanderbilt 6-3, 6-4 in a matchup of unseeded players. McLachlan will face second-seeded Marcos Giron of UCLA. The unseeded McDonald ousted 9-16 seed Nik Scholtz of Mississippi 1-6, 6-3, 6-4 after knocking off fourth-seeded Mitchell Frank of Virginia in the first round. McDonald will take on 9-16 Soren Hess-Olesen of Texas. Giron and Hess-Olesen are the only remaining men's seeds. Cal's Gregory Bayane and Chase Melton reached the doubles quarterfinals with a 5-7, 6-2, 7-6 (5) victory over Ian Dempster and Robbie Mudge of North Carolina State. Dempster and Mudge served for the match at 5-4 in the third set and led 4-0 in the tiebreaker. Bayane and Melton will meet second-seeded Mikelis Libietis and Hunter Reese of Tennessee, who downed Giron and McDonald 6-1, 6-4. Ahn returned to the court to play doubles with Zhao, but they lost to 5-8 seeds Monique Albuquerque and Clementina Riobueno of Miami 6-4, 7-5 in the round of 16. That ended Ahn's collegiate career. The 5-foot-5 (1.65-meter) Ahn, from Upper Saddle River, N.J., has been hampered with injuries since her last year of high school. Her greatest moment at Stanford came when she lifted the Cardinal to last year's NCAA title with a three-set victory at No. 2 singles in a 4-3 win over Texas A&M. Stanford's Carol Zhao, a freshman from Canada, upset sixth-seeded Lauren Herring of host Georgia 7-6 (4), 7-5 today to reach the round of 16 at the NCAA Championships in Athens, Ga.
Zhao's teammate, third-seeded Kristie Ahn, also advanced. The senior from Upper Saddle River, N.J., defeated UCLA's Kyle McPhillips 6-4, 6-2 in a matchup of players who have clinched the last two NCAA team titles. Ahn won at No. 2 singles against Texas A&M last year, and McPhillips triumphed at No. 3 against North Carolina on Tuesday. Joining Zhao and Ahn as All-Americans in the round of 16 were 9-16 seed Jenny Jullien of Saint Mary's and Lynn Chi of Cal. Jullien, a senior from France, beat USC's Giuliana Olmos of Fremont 6-3, 7-6 (4). Falling in the second round were Stanford's Krista Hardebeck, Taylor Davidson and Caroline Doyle, and Cal's Anett Schutting and Zsofi Susanyi. Schutting was seeded 9-16, and Susanyi reached the semifinals two years ago as a freshman. Hardebeck, a sophomore from Santa Ana, had upset fourth-seeded Julia Elbaba of Virginia. The team of Ahn and Zhao also reached the round of 16 in doubles. On the men's side, Cal senior Ben McLachlan and UCLA freshman Mackenzie McDonald, from Piedmont in the San Francisco Bay Area, advanced to the round of 16. No seeds remain in the top half of the draw. Only three are left in the bottom half, where McLachlan and McDonald reside. Lynn Chi, Cal, def. Romy Kolzer, Clemson, 7-5, 6-1. Kristie Ahn (3), Stanford, def. Kyle McPhillips, UCLA, 6-4, 6-2. Abigail Tere-Apisah, Georgia State, def. Zsofi Susanyi, Cal, 7-6 (3), 6-1. Silvia Garcia (9-16), Georgia, def. Taylor Davidson, Stanford, 6-0, 6-7 (6), 7-5. Carol Zhao, Stanford, def. Lauren Herring (6), Georgia, 7-6 (4), 7-5. Ester Goldfeld, Duke, def. Krista Hardebeck, Stanford, 5-7, 6-3, 6-2. Jenny Jullien (9-16), Saint Mary's, def. Giuliana Olmos, USC/Fremont, 6-3, 7-6 (4). Danielle Collins, Virginia, def. Anett Schutting (9-16), Cal, 6-3, 6-3. Robin Anderson (2), UCLA, def. Caroline Doyle, Stanford, 6-2, 6-3. Kristie Ahn and Carol Zhao, Stanford, def. Julia Fellerhoff and Rebecca Shine, Louisville, 4-6, 6-3, 6-2. Ben McLachlan, Cal, def. Andrew Harris, Oklahoma, 7-5, 6-4. Mackenzie McDonald, UCLA/Piedmont, def. Jason Tahir, Duke, 6-4, 6-3. Gregory Bayane and Chase Melton, Cal, def. Becker O'Shaughnessey and Daniil Proskura (5-8), Alabama, 7-6 (5), 6-4. Marcos Giron and Mackenzie McDonald, UCLA (McDonald is from Piedmont), def. Casey MacMaster and Denis Nguyen, Harvard, 7-6 (2), 4-6, 7-6 (2). Seven of the top eight men's seeds, including No. 1 Clay Thompson of UCLA, exited today in the first round of singles at the NCAA Championships. Pulling off two of the upsets in Athens, Ga., were Mackenzie McDonald of Piedmont in the San Francisco Bay Area and Ben McLachlan of Cal. Two Oklahoma players, No. 5 Guillermo Alcorta and No. 7 Axel Alvarez Llamas, withdrew from the singles tournament after the Sooners lost to USC 4-2 in Tuesday's team final. The reasons were not immediately available. 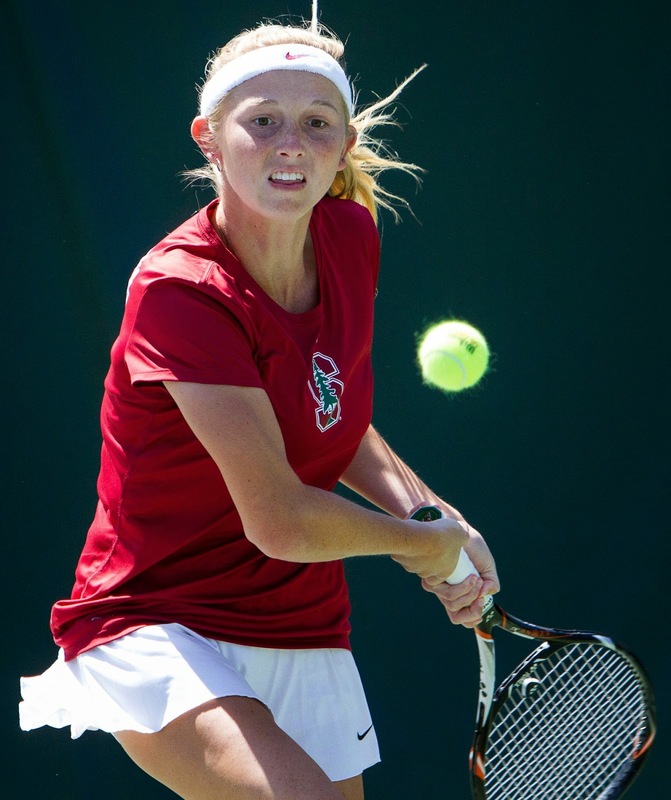 Stanford's Krista Hardebeck, meanwhile, recorded the biggest upset in the first round of women's singles with a 6-2, 6-2 victory over fourth-seeded Julia Elbaba of Virginia. McDonald, a UCLA freshman ranked 35th, knocked off fourth-seeded Mitchell Frank, a junior at Virginia, 6-2, 7-5. Frank gave the Cavaliers their first NCAA team title in tennis last year with a 0-6, 7-5, 6-4 win over UCLA's Adrien Puget at No. 3 singles, saving a championship point in the process. "I was pretty excited to play Mitchell again because I lost to him at the beginning of the year," McDonald told reporters. "It's the end of the year, and I thought it would be a great match to see improvements and kind of see where I am. I'm really happy I pulled it out because it shows me that I've improved and done better since the start of the year." McLachlan, a senior from New Zealand, held off No. 8 Jared Hiltzik of Illinois 7-5, 4-6, 6-3. Thompson, a 6-foot-6 (1.98-meter) senior from Venice Beach, lost to 47th-ranked Roberto Cid of South Florida 6-3, 6-3. Also falling were No. 3 Julian Lenz of Baylor and No. 6 Alex Domijan of Virginia. No. 2 Marcos Giron of UCLA avoided the upset trend, overwhelming 27th-ranked Hunter Reece of Tennessee 6-1, 6-1. Hardebeck, the nation's top recruit coming out of high school in Santa Ana in 2012, rebounded from three consecutive straight-set losses in singles in the women's team tournament. No. 11 seed and defending champion Stanford fell to No. 7 North Carolina 4-3 in the semifinals. "I haven't really had the best season, and my team, unfortunately, lost in the semis, so I just came out here and tried to give it all and just swing away," said Hardebeck, who improved to 17-13 in singles this season. "At this point, I don't really have anything to lose. I was really happy that everything was going well and that it worked out in my favor." Hardebeck's teammate, third-ranked Kristie Ahn, bounced back from a 6-7 (4), 6-0, 6-0 loss to No. 1 Jamie Loeb in the deciding match against North Carolina. Ahn, a senior from Upper Saddle River, N.J., pounded Stephanie Nauta of Virginia 6-3, 6-0. Two Cal women eliminated 9-16 seeds. Zsofi Susanyi, a junior from Hungary and NCAA semifinalist as a freshman, defeated Cristina Stancu of Texas A&M 6-0, 6-4. Lynn Chi, a sophomore from Weston, Fla., outlasted Emina Bektas of Michigan 2-6, 7-6 (6), 6-1. Also advancing were Stanford freshmen Carol Zhao, Taylor Davidson and Caroline Doyle; Cal's Anette Schutting; Saint Mary's Jenny Jullien, seeded 9-16; and USC's Giuliana Olmos, from Fremont in the San Francisco Bay Area. Falling were Ellen Tsay of Stanford, Denise Starr of Cal and Katie Le of Santa Clara. The men's and women's doubles tournaments begin on Thursday. All singles and doubles finals are scheduled for Monday. Collegiate Hall of Fame -- Matt Anger, who was born and raised in the San Francisco Bay Area, and former Stanford star Alex Kim are being inducted in the Men's Collegiate Tennis Hall of Fame today with five others in Athens. Anger was a three-time All-American at USC, helping the Trojans finish third in the 1983 NCAA Championships. Before his collegiate career, he won the Wimbledon junior boys singles title in 1981 and was ranked as the No. 1 junior in the world by Tennis Magazine. Anger played on the ATP tour for eight years, climbing to a career high of No. 23 in singles and reaching the round of 16 in singles at Wimbledon and the U.S. Open in 1986. The 50-year-old Anger is in his 20th season as the men's head coach at Washington. Kim was a two-time All-American, won the 2000 NCAA singles title as a junior and played on two national championship teams (1998 and 2000). Joining Anger and Kim in the Hall of Fame are coaches Billy Chadwick (Mississippi), Timon Corwin (Kalamazoo) and James Wadley (Oklahoma State), player Juan Farrow (Southern Illinois-Edwardsville) and contributor Doug Conant (Northwestern). Former Stanford star Mallory Burdette, recovering from surgery on her right (playing) shoulder in November, dropped another 30 places to No. 318 in the world in this week's rankings. Burdette, 23, missed last week's Italian Open after losing in the first round there as a qualifier in 2013. She hopes to return to the circuit late this year. The 5-foot-10 (1.77-meter) Burdette turned pro after reaching the third round of the 2012 U.S. Open, forgoing her senior year, and shot up to a career-high No. 68 last June. At Stanford, Burdette won NCAA doubles titles in 2011 and 2012 (with Hilary Barte and Nicole Gibbs, respectively) and lost to Gibbs in the 2012 NCAA singles final. Bob Bryan, 36 years old, 1998 NCAA doubles champion from Stanford -- Career-high No. 1 in doubles (no change), unranked in singles. Mike Bryan, 36 years old, 1998 NCAA doubles champion from Stanford -- Career-high No. 1 in doubles (no change), unranked in singles. Bradley Klahn, 23 years old, 2010 NCAA singles champion and 2011 NCAA doubles runner-up from Stanford -- No. 73 in singles (-2), No. 156 in doubles (-2). Scott Lipsky, 32 years old, 2002 NCAA doubles runner-up from Stanford -- No. 41 in doubles (-3), unranked in singles. Sam Querrey, 26 years old, San Francisco native, Sacramento Capitals (2012-13) -- No. 64 in singles (+2), No. 132 in doubles (-3). Dmitry Tursunov, 31 years old, trains at Gorin Tennis Academy in Sacramento suburb of Granite Bay -- No. 32 in singles (+1), No. 122 in doubles (-2). Mallory Burdette, 23 years old, NCAA singles runner-up in 2012 and NCAA doubles champion in 2011 and 2012 from Stanford -- No. 318 in singles (-30), No. 1,133 in doubles (-1). Nicole Gibbs, 21 years old, NCAA singles champion in 2012 and 2013 and NCAA doubles champion in 2012 from Stanford -- No. 165 in singles (no change), No. 539 in doubles (+1). Macall Harkins, 28 years old, Redding resident -- No. 368 in doubles (+2), No. 706 in singles (-1). Raquel Kops-Jones, 31 years old, 2003 NCAA doubles champion from Cal -- No. 14 in doubles (+1), No. 1,073 in singles (+5). Maria Sanchez, 24 years old, born and raised in Modesto -- No. 100 in doubles (+1), No. 250 in singles (-8). Allie Will, 23 years old, born in San Mateo -- No. 116 in doubles (-4), No. 425 in singles (-13). Dusseldorf (men), early rounds, Tennis Channel, 4-8 p.m. (delay), 8 p.m.-7 a.m. Thursday (repeat). Nice (men), quarterfinals, Tennis Channel, noon-4 p.m. (delay). Dusseldorf (men), quarterfinals, Tennis Channel, 4-8 p.m. (delay). Strasbourg (women), quarterfinals, Tennis Channel, 8 p.m.-midnight (delay). Nice (men), semifinals, Tennis Channel, noon-4 p.m. (delay). Strasbourg (women), semifinals, Tennis Channel, 8 p.m.-midnight (delay). Nurnberg (women), final, Tennis Channel, 2-3 p.m. (delay). Nice (men), final, Tennis Channel, 4-6 p.m. (delay). Dusseldorf (men), final, Tennis Channel, 6-8 p.m. (delay). Strasbourg (women), final, Tennis Channel, 8-10 p.m. (delay). FRENCH OPEN (men and women), first round, ESPN2, 2-7 a.m. (live). FRENCH OPEN (men and women) first round, Tennis Channel, 7 a.m.-4 p.m. (live/repeat). FRENCH OPEN (men and women), first round, NBC, 9 a.m.-noon (live). FRENCH OPEN Tonight (men and women), Tennis Channel, 4 p.m.-1 a.m. Monday (repeat). FRENCH OPEN Tonight (men and women), Tennis Channel, 4 p.m.-1 a.m. Tuesday (repeat). FRENCH OPEN Tonight (men and women), Tennis Channel, 4 p.m.-1 a.m. Wednesday (repeat). Wednesday-Monday -- NCAA Men's and Women's Singles and Doubles Championships, Athens, Ga.
SUNDAY-JUNE 8 -- FRENCH OPEN. 2013 champions: Rafael Nadal, Serena Williams, Bob Bryan-Mike Bryan, Ekaterina Makarova-Elena Vesnina, Lucie Hradecka-Frantisek Cermak. June 7-8, 14-17 -- NorCal Boys 18 and 16 Junior Sectional Championships, Rio Del Oro Racquet Club, Sacramento, Calif.
June 7-8, 14-17 -- NorCal Girls 18 and 16 Junior Sectional Championships, Arden Hills Resort & Spa, Sacramento, Calif.
June 7-8, 14-17 -- NorCal 14s Junior Sectional Championships, University of the Pacific, Stockton, Calif.
June 7-8, 14-17 -- NorCal 12s Junior Sectional Championships, Sunnyvale Tennis Center, Sunnyvale, Calif.
JUNE 23-JULY 6 -- WIMBLEDON. 2013 champions: Andy Murray, Marion Bartoli, Bob Bryan/Mike Bryan, Hsieh Su-Wei/Peng Shuai, Daniel Nestor/Kristina Mladenovic. July 7-12 -- $50,000 FSP Gold River Women's Challenger, Gold River Racquet Club, Gold River, Calif. 2013 champions: Mayo Hibi, Naomi Broady-Storm Sanders. July 28-Aug. 3 -- Bank of the West Classic, Stanford. 2013 champions: Dominika Cibulkova, Raquel Kops-Jones-Abigail Spears. Aug. 4-10 -- $100,000 Comerica Bank Challenger, Seascape Sports Club, Aptos, Calif. 2013 champions: Bradley Klahn, Jonathan Erlich-Andy Ram. Connor Farren became an NCAA champion today. Not an individual champion, but he'll take it. The freshman from Foster City in the San Francisco Bay Area lost his only match, but the top-seeded USC men rallied to beat second-seeded Oklahoma 4-2 for the title in Athens, Ga. The Trojans (32-3) overcame a 2-0 deficit. Max de Vroome, a sophomore from the Netherlands, provided the clincher with a 4-6, 6-3, 6-4 victory over Andrew Harris at No. 4 singles. Harris, a freshman from Melbourne, Australia, is ranked No. 53, and de Vroome is No. 91. The title was the Trojans' fifth in six years and ninth overall. Stanford holds the men's and women's records with 15 and 17, respectively. Farren and Roberto Quiroz lost to Guillermo Alcorta and Harris 8-5 at No. 2 doubles. Oklahoma (28-4) made its first appearance in the final. The Sooners' John Roddick, Andy's older brother, was named the Intercollegiate Tennis Association National Coach of the Year, the ITA announced today. USC's victory completed Southern California's first sweep of the NCAA titles. Fifth-seeded UCLA edged No. 7 North Carolina 4-3 for its second NCAA women's tennis championship and the Bruins' record 111th team title in any sport. The Bruins, who finished 27-2, clobbered Sacramento State 4-0 in the first round at UCLA. Kyle McPhillips, ranked 38th, clinched the victory over North Carolina (29-6) with a 6-4, 3-6, 6-3 decision over No. 59 Caroline Price at No. 3 singles. The No. 1 singles match featured the top two players in the nation. UCLA junior Robin Anderson, ranked second, dominated freshman Jamie Loeb 6-2, 6-2 to give the Bruins a 2-0 lead. The 5-foot-3 (1.61-meter) Anderson reached two Challenger finals in Northern California last year, one in doubles and one in singles. Playing as an amateur, the Matawan, N.J., resident lost with Lauren Embree of Marco Island, Fla., to Naomi Broady of Great Britain and Storm Sanders of Australia in the $50,000 FSP Gold River Women's Challenger in the Sacramento area in July. Anderson also fell to Adriana Perez of Venezuela in the $25,000 Ascension Project Women's Challenger in September. UCLA won its first women's tennis title in 2008 with the help of sophomore Yasmin Schnack, from the Sacramento suburb of Elk Grove. Schnack played professionally for two-plus years, climbing as high as No. 140 in the world in doubles, before starting nursing school in Phoenix in January. The 64-player NCAA men's and women's singles tournaments begin Wednesday, and the 32-team doubles tourneys start on Thursday. All finals are scheduled for Monday. Kristie Ahn (3), Stanford, vs. Stephanie Nauta, Virginia. Krista Hardebeck, Stanford vs. Julia Elbaba (4), Virginia. Carol Zhao, Stanford, vs. Georgiana Patrasc, Mississippi State. Taylor Davidson, Stanford, vs. Pleun Burgmans, Auburn. Ellen Tsay, Stanford, vs. Quinn Gleason, Notre Dame. Caroline Doyle, Stanford vs. Stefanie Tan, Texas Christian. Anett Schutting (9-16), Cal, vs. Saska Gavrilovska, Texas A&M. Denise Starr, Cal, vs. Ester Goldfeld, Duke. Zsofi Susanyi, Cal, vs. Cristina Stancu (9-16). Lynn Chi, Cal, vs. Emina Bektas (9-16), Michigan. Jenny Jullien (9-16), Saint Mary's, vs. Ronit Yurovsky, Michigan. Katie Le, Santa Clara, vs. Olivia Janowicz (9-16), Florida. Guiliana Olmos (Fremont resident), USC, vs. Loreta Alonso, South Florida. Kristie Ahn and Carol Zhao, Stanford, vs. Julia Fellerhoff and Rebecca Shine, Louisville. Giuliana Olmos and Zoe Scandalis, USC, vs. Stefanie Hristov and Cristina Stancu, Texas A&M. Ben McLachlan, Cal, vs. Jared Hiltzik (8), Illinois. Mackenzie McDonald (Piedmont resident), UCLA, vs. Mitchell Frank (4), Virginia. Gregory Bayane and Chase Melton, Cal, vs. Becker O'Shaughnessey and Daniil Proskura (5-8), Alabama. Marcos Giron and Mackenzie McDonald (Piedmont resident), UCLA, vs. Casey MacMaster and Denis Nguyen, Harvard. Carolina in the deciding match of today's semifinal. 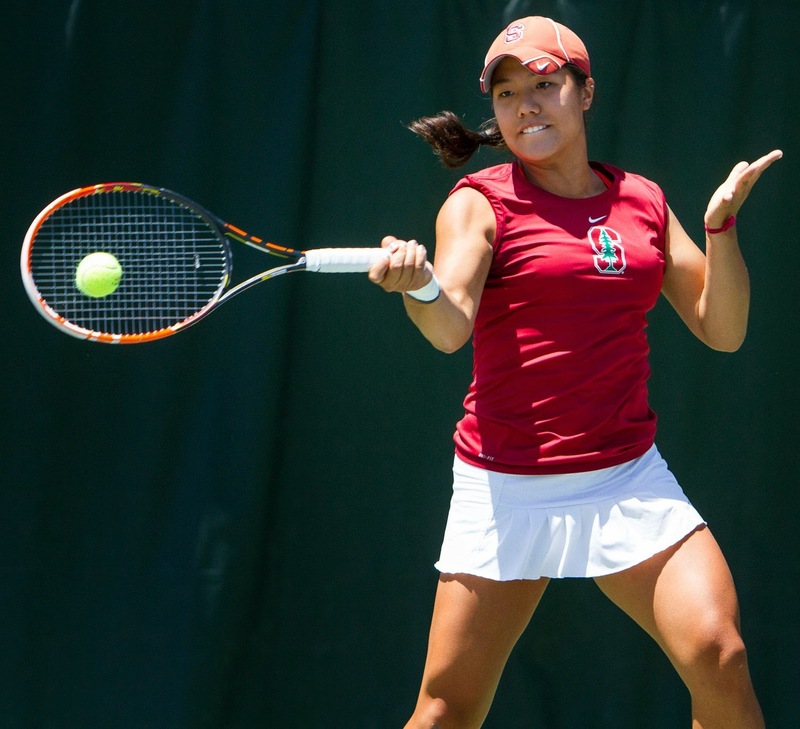 Kristie Ahn was one set from giving the Stanford women another dramatic victory in the NCAA Championships. Then the senior from Upper Saddle River, N.J., fell apart. Ahn, ranked third, lost to top-ranked Jamie Loeb of North Carolina 6-7 (4), 6-0, 6-0 at No. 1 singles today in the deciding match of the Tar Heels' 4-3 semifinal victory over the defending champion Cardinal, seeded 11th, in Athens, Ga.
"I knew if I kept my composure, like I did all match, I’d be able to slowly break her down and conserve my energy," Loeb, a freshman from Ossining, N.Y., told reporters. "Physically, I felt fine at the end of the match, and I think that played a big part." Seventh-seeded North Carolina (29-5) will meet No. 5 UCLA (26-2) for the title on Tuesday. The Bruins whipped No. 8 Florida 4-0. Stanford, which overcame deficits of 2-0 and 3-2 against sixth-seeded Cal in the round of 16, ended the team portion of its season at 20-3. The NCAA singles and doubles tournaments begin on Wednesday in Athens. The Cardinal fell behind 2-0 to North Carolina as sophomore Krista Hardebeck lost in straight sets at No. 2 singles for the third straight match. 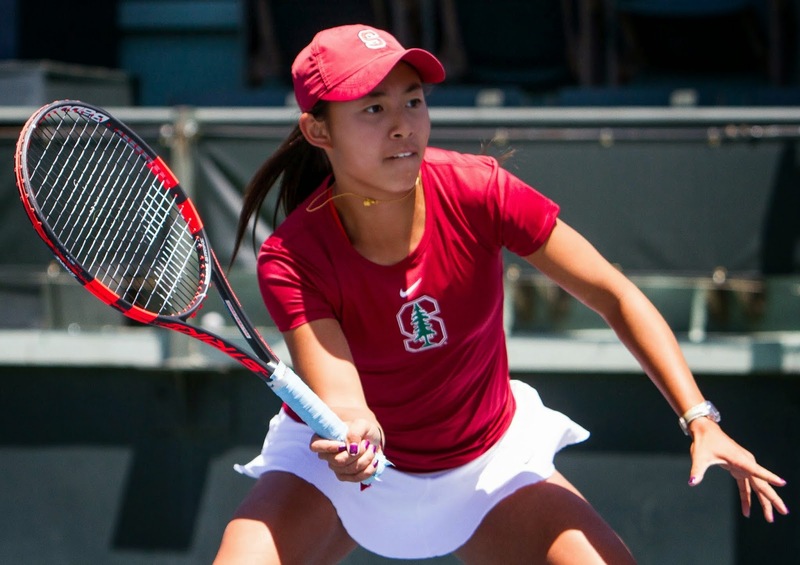 With Stanford trailing 3-1, freshman Caroline Doyle of San Francisco and junior Ellen Tsay of Pleasanton won at No. 6 and No. 5 singles, respectively, to tie the match. Ahn, however, could not repeat her heroics in last year's final. She won the deciding match in three sets at No. 2 singles to give Stanford a 4-3 victory over Texas A&M. The men's semifinals featured two freshmen from the San Francisco Bay Area. Top-seeded USC, with Connor Farren of Foster City, eliminated No. 4 seed and defending champion Virginia 5-1. Sixth-seeded UCLA, with Mackenzie McDonald of Piedmont at No. 3 singles and No. 1 doubles, lost to second-seeded Oklahoma 4-2. The Bruins reached last year's final. Farren and Roberto Quiroz defeated Thai-Son Kwiatkowski and Mac Styslinger 8-5 at No. 2 doubles. Styslinger won last year's NCAA doubles title with since-graduated Jarmere Jenkins. Farren did not play not play singles. McDonald, ranked 35th in singles, beat No. 41 Dane Webb 6-4, 6-4 at No. 3. The 10th-ranked team of Marcos Giron and McDonald lost to unseeded Axel Alvarez and Webb 8-6 at No. 1. USC will seek its fifth NCAA team title in six years on Tuesday. Oklahoma -- coached by John Roddick, Andy's older brother -- will make its first appearance in the final. 1. No. 3 Jamie Loeb and Hayley Carter (NC) def. No. 10 Kristie Ahn and Carol Zhao, 8-5. 2. No. 13 Whitney Kay and Caroline Price (NC) def. No. 50 Taylor Davidson and Ellen Tsay, 8-2. 3. Caroline Doyle and Krista Hardebeck (S) def. Ashley Dai and Tessa Lyons, 8-4. Order of finish: 2, 3, 1. 1. No. 1 Jamie Loeb (NC) def. No. 3 Kristie Ahn, 6-7 (4), 6-0, 6-0. 2. No. 5 Hayley Carter (NC) def. No. 51 Krista Hardebeck, 6-2, 6-1. 3. No. 59 Caroline Price (NC) def. No. 21 Carol Zhao, 6-4, 6-4. 4. No. 50 Taylor Davidson (S) def. Whitney Kay, 6-3, 6-3. 5. No. 54 Ellen Tsay (S) def. Kate Vialle, 6-2, 7-6 (4). 6. No. 57 Caroline Doyle (S) def. Tessa Lyons, 6-2, 6-3. Order of finish: 2, 4, 3, 6, 5, 1. Stanford's freshmen came through again. Rookies led the way for the second straight match in the NCAA Championships as the No. 11 seed and defending champion Cardinal women defeated No. 3 Virginia 4-2 in the quarterfinals today in Athens, Ga.
Stanford (20-2), which has won nine consecutive NCAA Tournament matches as the lower seed, will face No. 7 North Carolina on Monday at 10 a.m. PDT (live streaming and scoring at www.ncaasports.com) for a berth in the final. The Tar Heels (28-5) upset No. 2 Alabama 4-2. With the score 2-2 against Virginia, Stanford received victories from freshmen Caroline Doyle and Carol Zhao. The 57th-ranked Doyle, from San Francisco, wore down Caryssa Peretz 6-2, 3-6, 6-0 at No. 6 singles to give the Cardinal a 3-2 lead. The 21st-ranked Zhao, from Canada, clinched the victory with a 7-6 (1), 7-6 (4) victory over No. 53 Stephanie Nauta at No. 3 singles. Freshman Taylor Davidson, ranked 50th, had given Stanford a 2-0 lead by beating 76th-ranked Rachel Pierson 6-4, 6-1 at No. 4 singles. Stanford's three freshmen are 9-0 in singles in four matches in the NCAA Championships. 1. No. 10 Kristie Ahn and Carol Zhao (S) def. Stefanie Nauta and Li Xi, 8-2. 2. No. 50 Taylor Davidson and Ellen Tsay (S) def. No. 7 Julia Elbaba and Rachel Pierson, 8-5. 3. Danielle Collins and Maci Epstein (V) def. Caroline Doyle and Amelia Herring, 8-2. Order of finish: 1, 3, 2. 1. No. 4 Julia Elbaba (V) led No. 3 Kristie Ahn, 7-5, 4-4, unfinished. 2. No. 32 Danielle Collins (V) def. No. 51 Krista Hardebeck, 6-4, 6-2. 3. No. 21 Carol Zhao (S) def. No. 53 Stephanie Nauta, 7-6 (1), 7-6 (4). 4. No. 50 Taylor Davidson (S) def. No. 76 Rachel Pierson, 6-4, 6-1. 5. Maci Epstein (V) def. No. 54 Ellen Tsay, 7-6 (5), 6-3. 6. No. 57 Caroline Doyle (S) def. Caryssa Peretz, 6-2, 3-6, 6-0. Order of finish: 4, 2, 5, 6, 3. The 17th-ranked Cal men lost to ninth-ranked and ninth-seeded Texas 4-1 today in the round of 16 at the NCAA Championships in Athens, Ga.
Filip Bergevi, a freshman from Sweden, gave the Bears (17-8) their point with a 6-3, 6-3 victory over Adrien Berkowicz at No. 3 singles. The Longhorns (23-5), who also beat Cal during the regular season, will face top-seeded USC (29-3) in Sunday's quarterfinals. Senior women -- As usual, Northern California struggled against more populous Southern California. Tracy Houk of Montara and Martha Downing of Shingle Springs lost one-sided finals in the USTA National Women's Hard Court Championships in La Jolla. Houk, the No. 2 seed and defending champion, fell to top-seeded Ros (Fairbank) Nideffer of San Diego 6-2, 6-3 in the 50-and-overs. Downing, seeded second, succumbed to top-seeded Tina Karwasky of Glendale 6-1, 6-0 in the 60s. Nideffer, a 53-year-old former touring professional originally from South Africa, reached career highs of No. 12 in the world in doubles in 1986 and No. 15 in singles in 1990. She won the French Open women's doubles title in 1981 with Tanya Harford of South Africa and in 1983 with Candy Reynolds of the United States. Houk was coming off a 4-hour, 15-minute victory over fourth-seeded Judy Newman of Scotts Valley in the semifinals. Karwasky, who won the title for the third consecutive year, dropped only three games in the tournament. 1. No. 16 Soren Hess-Olesen and Lloyd Glasspool (T) def. No. 28 Gregory Bayane and Chase Melton, 8-3. 2. Adrien Berkowicz and George Goldhoff (T) def. No. 86 Andre Goransson and Ben McLachlan, 8-1. 3. David Holiner and Jacoby Lewis (T) led Filip Bergevi and Mads Engsted, 6-4, abandoned. Order of finish: 2, 1. 1. No. 16 Soren Hess-Olesen (T) def. No. 55 Ben McLachlan (C), 6-4, 6-3. 2. Campbell Johnson (C) led No. 40 Lloyd Glasspool, 7-5, 3-0, abandoned. 3. Filip Bergevi (C) def. Adrien Berkowicz, 6-3, 6-3. 4. No. 102 George Goldhoff (T) def. Andre Goransson, 7-5, 6-3. 5. Gregory Bayane (C) led Nick Naumann, 6-4, 4-5, abandoned. 6. Clement Homs (T) def. Nikhil Jayashankar, 6-1, 6-2. Order of finish: 1, 6, 3, 4.
breaker to give the Cardinal a 4-3 victory over Cal in the NCAA Championships. The Stanford women had no business beating Cal on Thursday in the round of 16 at the NCAA Championships. The defending champion Cardinal trailed 2-0 and 3-2, leaving the match in the hands of two freshmen. The first suffered cramps and fatigue. The second faced two match points. Yet 11th-seeded Stanford rallied to stun sixth-seeded Cal 4-3 in Atlanta. The match was moved indoors from Athens, Ga., because of rain. Stanford (19-2) ended Cal's 14-match winning streak. The Cardinal, which had been the last team to beat the Bears (20-5), is scheduled to meet third-seeded Virginia on Saturday at 9 a.m. PDT (live streaming and scoring at www.ncaasports.com) in the quarterfinals in Athens. The Cavaliers (24-5) defeated No. 14 Baylor 4-1. 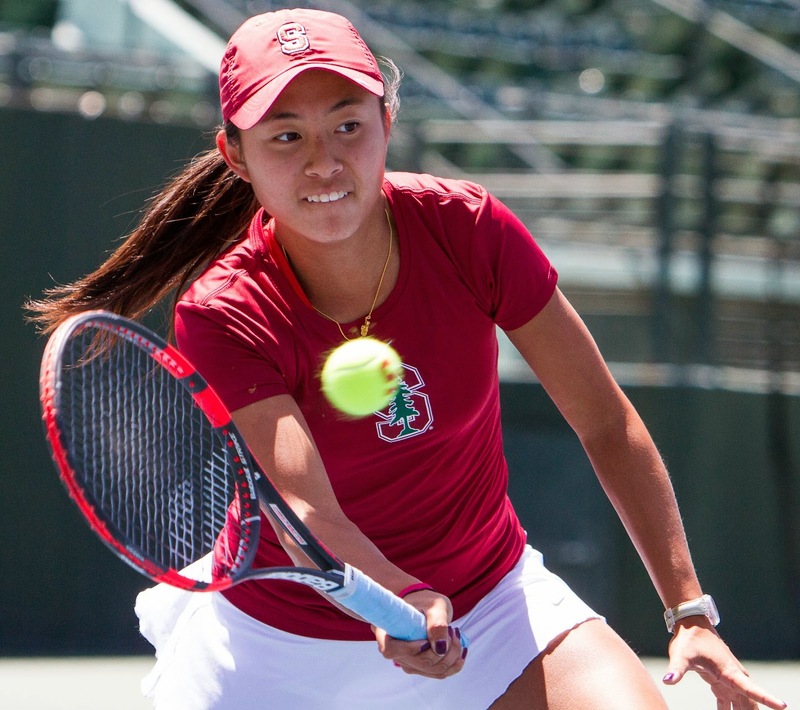 Another freshman, 21st-ranked Carol Zhao, put Stanford on the board with a 6-2, 6-3 victory over No. 18 Anett Schutting, a senior, at No. 2 singles. No. 3 Kristie Ahn evened the score 2-2, downing No. 30 Denise Starr 6-4, 6-2 at No. 1 singles. No. 87 Klara Fabikova put Cal of the brink of victory with a win at No. 5. After splitting sets at No. 4, Stanford's Taylor Davidson took an injury timeout for cramps and fatigue. She battled to 3-3 in the third set, then reeled off three straight games to beat Lynn Chi 6-2, 4-6, 6-3. In the deciding contest, No. 57 Caroline Doyle of San Francisco survived match points serving at 4-5, 15-40 in the second set and went on to beat No. 62 Maegan Manasse, also a freshman, 6-7 (5), 6-3, 7-6 (0). "We came all the way out here to go far in the tournament, and I was just trying to leave it all on the court," Doyle said on gostanford.com. "Even if I ended up losing, I just wanted to know that I gave it 100 percent. I ended up getting those points and securing the game." Said Cal coach Amanda Augustus: "Obviously that was heartbreaking from Maegan. We knew that this match was going to come down to the wire, as it does every time we play our rival. It was just great tennis on every court. Unfortunately, we had a couple of match points that we didn't convert, but that's what can happen when you have two freshmen out there at the end. You don't really know what you're going to get. "I think Stanford will go really far now in the tournament. I think we're two of the better teams this year, so I wish them luck. If it can't be us, I want it to be someone from our conference. My team fought really hard today and left it all out on the court. You can't ask for anything else." Please see full results below. Senior women -- In an all-Northern California showdown, No. 2 seed and defending champion Tracy Houk of Montara outlasted No. 4 seed Judy Newman of Scotts Valley 4-6, 6-2, 7-5 in 4 hours, 15 minutes to reach the women's 50 final of the USTA National Women's Hard Court Championships in La Jolla. Houk will meet top-seeded Ros (Fairbank) Nideffer of San Diego today for the title. Nideffer, a two-time French Open doubles champion, topped third-seeded Frances Chandler of Jackson, Tenn., 6-4, 6-1. Second-seeded Martha Downing of Shingle Springs in the Sacramento area will face top-seeded Tina Karwasky of Glendale in the women's 60 final. Downing beat third-seeded Sherri Bronson of Scottsdale, Ariz., 6-4, 6-2. 1. No. 10 Kristie Ahn and Carol Zhao (S) def. No. 41 Lynn Chi and Anett Schutting, abandoned. 2. No. 47 Maegan Manasse and Denise Starr (C) def. No. 50 Taylor Davidson and Ellen Tsay, 8-3. 3. No. 83 Klara Fabikova and Zsofi Susanyi (C) def. Caroline Doyle and Amelia Herring, 8-4. Order of finish: 3, 2. 1. No. 3 Kristie Ahn (S) def. No. 30 Denise Starr, 6-4, 6-2. 2. No. 23 Zsofi Susanyi (C) def. No. 41 Krista Hardebeck, 6-2, 6-1. 3. No. 21 Carol Zhao (S) def. No. 18 Anett Schutting, 6-2, 6-3. 4. No. 50 Taylor Davidson (S) def. Lynn Chi, 6-2, 4-6, 6-3. 5. No. 87 Klara Fabikova (C) def. No. 54 Ellen Tsay, 6-4, 6-3. 6. No. 57 Caroline Doyle (S) def. No. 62 Maegan Manasse, 6-7 (5), 6-3, 7-6 (0). Order of finish: 2, 3, 1, 5, 4, 6. Bradley Klahn, 23 years old, 2010 NCAA singles champion and 2011 NCAA doubles runner-up from Stanford -- No. 71 in singles (-5), No. 154 in doubles (+1). Scott Lipsky, 32 years old, 2002 NCAA doubles runner-up from Stanford -- No. 38 in doubles (no change), unranked in singles. Sam Querrey, 26 years old, San Francisco native, Sacramento Capitals (2012-13) -- No. 66 in singles (+6), No. 129 in doubles (-15). Dmitry Tursunov, 31 years old, trains at Gorin Tennis Academy in Sacramento suburb of Granite Bay -- No. 33 in singles (-1), No. 120 in doubles (+2). Mallory Burdette, 23 years old, NCAA singles runner-up in 2012 and NCAA doubles champion in 2011 and 2012 from Stanford -- No. 288 in singles (+7), No. 1,132 in doubles (+8). Nicole Gibbs, 21 years old, NCAA singles champion in 2012 and 2013 and NCAA doubles champion in 2012 from Stanford -- No. 165 in singles (+1), No. 540 in doubles (+4). Macall Harkins, 28 years old, Redding resident -- No. 370 in doubles (+2), No. 705 in singles (+8). Raquel Kops-Jones, 31 years old, 2003 NCAA doubles champion from Cal -- No. 15 in doubles (no change), No. 1,078 in singles (+10). Maria Sanchez, 24 years old, born and raised in Modesto -- No. 101 in doubles (-2), No. 242 in singles (+2). Allie Will, 23 years old, born in San Mateo -- No. 112 in doubles (+1), No. 412 in singles (+2). Italian Open (men and women), early rounds, Tennis Channel, 3 a.m.-12:30 p.m. (live), 1:30 p.m.-2 a.m. Thursday (repeat). Italian Open (men and women), round of 16, Tennis Channel, 3 a.m.-2 p.m. (live), 2:30 p.m.-2 a.m. Friday (repeat). Italian Open (men and women), quarterfinals, Tennis Channel, 3 a.m.-2 p.m. (live), 2:30 p.m.-2 a.m. Saturday (repeat). Italian Open (men and women), semifinals, Tennis Channel, 3 a.m.-1:30 p.m. (live), 2-11 p.m. (repeat). Italian Open (men and women), finals, Tennis Channel, 4:30-9:30 a.m. (live), 11 a.m.-10 p.m. (repeat). Thursday-May 20 -- NCAA Men's and Women's Championships, round of 16 through finals, Athens, Ga. Cal women vs. Stanford, Thursday, 9 a.m.; Cal men vs. Texas, Friday, 6 a.m.
May 21-26 -- NCAA Men's and Women's Singles and Doubles Championships, Athens, Ga.
MAY 25-JUNE 8 -- FRENCH OPEN. 2013 champions: Rafael Nadal, Serena Williams, Bob Bryan-Mike Bryan, Ekaterina Makarova-Elena Vesnina, Lucie Hradecka-Frantisek Cermak. The 17th-ranked Cal men stunned Texas A&M, seeded eighth and ranked 10th, 4-3 on the Aggies' home courts on Sunday to reach the round of 16 in the NCAA Championships. Campbell Johnson won the deciding match at No. 2 singles in high humidity and temperatures in the upper 80s in College Station, Texas. The unranked senior from Rancho Santa Fe, a suburb of San Diego, defeated 22nd-ranked Shane Vinsent 6-4, 2-6, 6-3 to hand Texas A&M its first home loss in 16 matches this season. The Bears (17-7) will face Texas (22-5), seeded and ranked ninth, on Friday at 6 a.m. (PDT) in Athens, Ga. The Longhorns will be Cal's third straight opponent from the Lone Star State. The Bears whipped No. 41 Texas Tech 4-0 in the first round on Saturday in College Station. Stanford, which has won 17 NCAA men's team titles but none since 2000, lost in the first round of the NCAAs for the second consecutive year. The Cardinal fell to No. 43 Tulsa 4-2 on Saturday in Waco, Texas, to end its season at 14-6. NCAA Women's Championships -- Sixth-ranked Cal will meet archrival and defending champion Stanford, ranked 11th, on Thursday at 9 a.m. (PDT) in the round of 16 in Athens. The Bears (20-4) extended their winning streak to 14 matches with a 4-0 victory over Pepperdine in the second round on Saturday in Berkeley. The Cardinal (18-2) pounded No. 53 Long Beach State 4-0 at Stanford to reach the last 16 for the 29th consecutive year. Stanford and Cal have split their two meetings this season, with each team winning on the other's courts. The Cardinal handed the Bears their last loss, 5-2 in Berkeley on March 8, and Cal rolled to a 6-1 victory at Stanford on April 19. Stanford seeks its 18th women's team title and Cal its first. Florida ranks second behind the Cardinal with six crowns. ITF Women's Circuit -- Modesto product Maria Sanchez, seeded eighth, lost to fifth-seeded Heidi El Tabakh of Canada 6-3, 6-4 on clay in the final of a $25,000 Challenger in Raleigh, N.C.
Sanchez, the 2011 Pacific-12 Conference Women's Player of the Year as a senior at USC, tumbled from a career-high No. 107 in the world last July to No. 244 entering the Raleigh tournament. Maze Cup -- Northern California juniors defeated Southern California 13-7 at the Berkeley Tennis Club to win the title for only the third time in the tournament's 41-year history but second in a row. Andrew Gu of El Cerrito won the clinching match, routing Jacob Brumm of Rancho Santa Fe 6-1, 6-1 in the boys 16s. NorCal ended a 28-year drought in the tournament last year. Past participants include Pete Sampras, Michael Chang and Lindsay Davenport. The 11th-ranked Stanford women opened the defense of their NCAA championship with a 4-0 victory over Quinnipiac on Friday at Stanford. In the clinching match at No. 2 singles, 51st-ranked Krista Hardebeck routed Jacqueline Raynor 6-1, 6-0. The Cardinal (17-2) will meet No. 53 Long Beach State in the second round today at 1 p.m. at the Taube Family Tennis Stadium. The 49ers edged No. 21 Tulsa 4-3 in 4 hours, 53 minutes. Meanwhile, the sixth-ranked Cal women trounced Fairleigh Dickinson 4-0 in the opening round at the Hellman Tennis Complex in Berkeley. Freshman Denise Starr, ranked 30th, provided the clincher at No. 1 singles by dismantling Ksenija Tihomirova 6-1, 6-1. The Bears (19-4), the Pacific-12 Conference champions, will face 24th-ranked Pepperdine (19-4) in the second round today at noon at the Hellman Tennis Complex. The Waves pounded No. 40 LSU 4-0. Sacramento State lost to third-ranked UCLA 4-0 at UCLA to end the season at 12-17. The NCAA men's tournament will begin today at sites around the country. No. 17 Cal (15-7) will take on No. 41 Texas Tech (13-10) in College Station, Texas, at 7 a.m. PDT, with the winner likely facing host and 10th-ranked Texas A&M (24-6). No. 27 Stanford (14-5) will play No. 43 Tulsa (15-12) in Waco, Texas, at 9 a.m. PDT, with the survivor probably meeting host and sixth-ranked Baylor (23-5). Juniors -- The Maze Cup, pitting Northern California against Southern California, is scheduled to begin today at 9 a.m. at the Berkeley Tennis Club. --Billy Griffith of Fresno and Logan Staggs of Tracy in the boys 18s. --Victor Pham of Saratoga, Andrew Gu of El Cerrito and Alexander Keyser of Danville in the boys 16s. --Michaela Gordon of Saratoga and Rachel Chong of Danville in the girls 18s. --Alaina Miller of Saratoga, Vanessa Nommensen of San Jose and Sarah Hu of Oakland in the girls 16s. Gordon, 14, beat 24-year-old Denise Muresan, ranked No. 481 in the world, in the first round of a $25,000 Challenger tournament in Raleigh, N.C., this week. Gordon then lost to eighth-seeded Maria Sanchez, a Modesto product who will play in today's semifinals. Sacramento native Collin Altamirano has verbally committed to NCAA defending champion Virginia. Altamirano confirmed recently that he will enroll at Virginia, founded by Thomas Jefferson in Charlottesville in 1819, in January unless he turns professional. 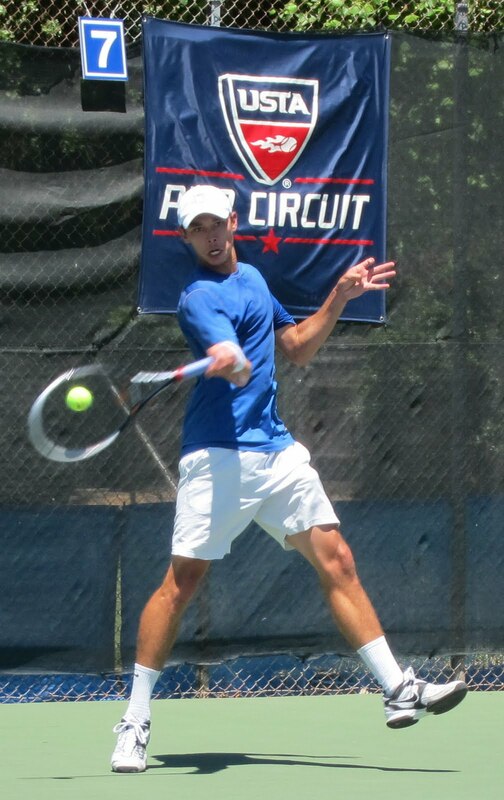 Last year's USTA boys 18 national champion, who trains at the Arden Hills Resort and Spa in Sacramento, said he will decide by the end of the year based on his results in pro tournaments. The 6-foot-2 (1.87-meter) Altamirano has played as an amateur in eight pro tournaments, all in the United States, this year. He has had some overall success in five Futures, comparable to Class A in baseball, and struggled in three Challengers, equivalent to Triple A. In the Futures, Altamirano reached the singles semifinals at Bakersfield in March and quarterfinals at Sunrise, Fla., in February. He won the doubles title at Boynton Beach, Fla., in February and advanced to the doubles final at Sunrise the following week, playing with fellow 18-year-old Deiton Baughman of Carson in each tournament. In the singles semis at Bakersfield, Altamirano came within a tiebreaker of beating third seed and eventual champion Daniel Kosakowski of Downey before falling 3-6, 7-6 (2), 6-3. Kosakowski, who turned pro in 2011 after playing No. 1 at UCLA as a freshman, has four wins over top-100 players. Virginia won its first NCAA Division I men's tennis title last year, ending USC's four-year reign. The fourth-ranked Cavaliers (23-2), coached by Brian Boland, will open their defense on Saturday at home against Army. Altamirano said last summer that he also had received scholarship offers from Illinois, Vanderbilt, Wake Forest and Washington. He added that he was not being recruited by Stanford, Cal, USC or UCLA but didn't elaborate. Altamirano could not be reached today. Last August, Altamirano became the first unseeded player in the 71-year history of the USTA Boys 18 National Championships in Kalamazoo, Mich., to capture the title. Past winners include International Tennis Hall of Famers Michael Chang, Stan Smith and Dennis Ralston. The title gave Altamirano a wild card into the U.S. Open men's singles draw, in which he lost to 22nd-seeded Philipp Kohlschreiber of Germany 6-1, 6-3, 6-1 in the first round. Altamirano then reached the junior boys quarterfinals at Flushing Meadows. Altamirano trained with Roger Federer in Dubai, United Arab Emirates, where the Swiss star has a residence, for two weeks in December and served as a practice partner for the U.S. Davis Cup team's first-round matchup against Great Britain, Jan. 31-Feb. 2 in San Diego. Great Britain upset the Americans 3-1. Portugal Open yet dropped 25 places in the world rankings. Dmitry Tursunov had a good week in doubles. The 31-year-old Russian, who's based in the Sacramento suburb of Granite Bay, reached the semifinals of the Portugal Open in Oeiras with Matthew Ebden of Australia. Still, Tursunov dropped 25 places in the world rankings to No. 122. How can that be? Simple. During the same week last year, Tursunov won the Munich title with Jarkko Nieminen of Finland. The rankings are based on a revolving 52-week system. As the results from one week fall off the computer, they are replaced by the results in the corresponding week the next year. Similarly, former Stanford All-American Scott Lipsky of Irvine won the doubles title in the Portugal Open with Santiago Gonzalez of Mexico yet remained No. 38 because they also took the crown last year. Had Lipsky fallen short of the title, he would have dropped in the rankings. Bradley Klahn, 23 years old, 2010 NCAA singles champion and 2011 NCAA doubles runner-up from Stanford -- No. 66 in singles (-1), No. 155 in doubles (-1). Sam Querrey, 26 years old, San Francisco native, Sacramento Capitals (2012-13) -- No. 72 in singles (no change), No. 116 in doubles (+2). 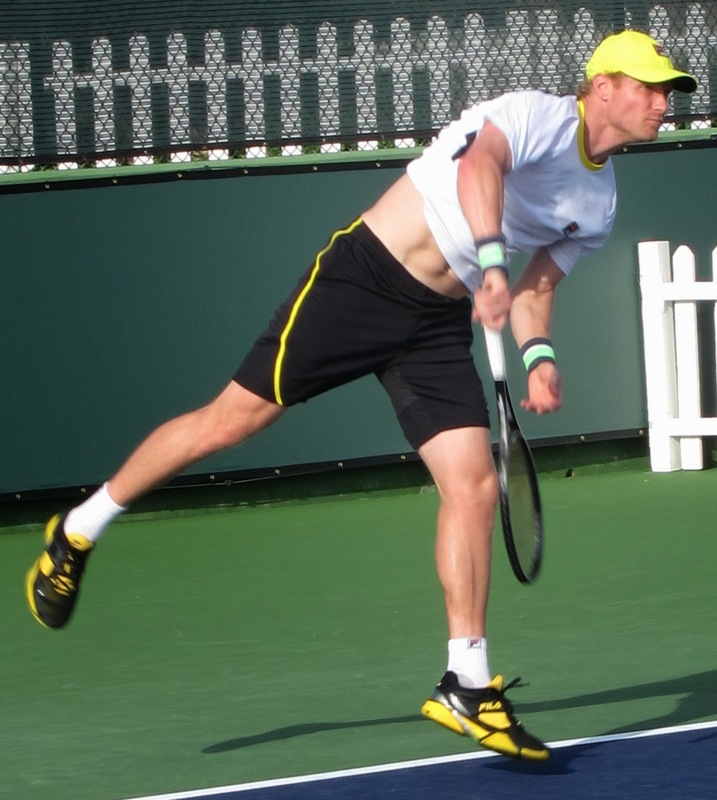 Dmitry Tursunov, 31 years old, trains at Gorin Tennis Academy in Sacramento suburb of Granite Bay -- No. 32 in singles (no change), No. 122 in doubles (-25). Mallory Burdette, 23 years old, NCAA singles runner-up in 2012 and NCAA doubles champion in 2011 and 2012 from Stanford -- No. 295 in singles (+1), No. 1,140 in doubles (+1). Nicole Gibbs, 21 years old, NCAA singles champion in 2012 and 2013 and NCAA doubles champion in 2012 from Stanford -- No. 166 in singles (+1), No. 544 in doubles (+3). Macall Harkins, 28 years old, Redding resident -- No. 372 in doubles (+2), No. 713 in singles (+1). Raquel Kops-Jones, 31 years old, 2003 NCAA doubles champion from Cal -- No. 15 in doubles (no change), No. 1,088 in singles (+9). Maria Sanchez, 24 years old, born and raised in Modesto -- No. 99 in doubles (+1), No. 244 in singles (+4). Allie Will, 23 years old, born in San Mateo -- No. 113 in doubles (-6), No. 414 in singles (-9).